What is the best way to capture date of birth? Will need to retain information in specific fields of month, date year as a way to calculate age. 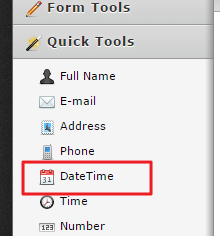 You may use the DateTime field from Quick Tools for capturing Date of Birth. Please check the following demo form that might help you in achieving your requirement with calculating age in days. Please feel free to clone this JotForm to your account to see how it works. Hope this information helps. Let us know if you need any further assistance. We will be happy to help. You might also like to try this form. It gives an accurate age in years using the Birth Picker.